After getting my multimedia degree, I decided to begin a career in tattooing and I have never looked back. I offer truly custom tattoos for each and every client. I will sit down and do a consultation with you to discuss your wants, desires and wishes. I pride myself in having a versatile style and have experience with a wide variety of tattoos including full color, black and grey, coverups, restoration and more. 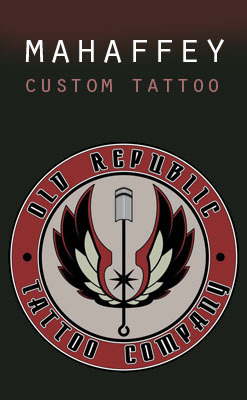 You can find me at the Old Republic Tattoo Company, where you will enjoy a clean and relaxed environment while you get your tattoo. Have an idea for a tattoo? Schedule a free design consultation where we can discuss your ideas. Find out how to best prepare for your appointment and how to take care of your tattoo for the best result.